The newest issue in which our main character Zack Overkill works to be found by a terrorist organization by visiting old haunts, realizing how he's grown as a person morally, and tripping his balls off form the hallucinatory effect of another character's powers. Now that's interesting! Ed Brubaker didn't have me that big on this story at the start, as it seemed like it was going to really mirror his and Sean Philips superb mini-series for the now defunct Wildstorm-imprint, Sleeper. 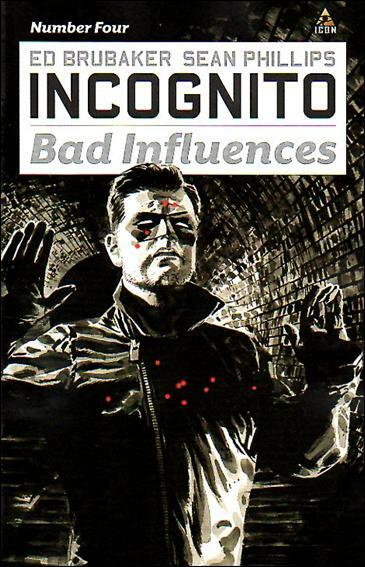 While this has some similar concepts such as a good guy being so deep-cover as a bad guy he might just really have gone bad, but there are other unique elements that make this story fun. There is some fighting with hi-tech lasers, a thickening plot with just what Black Death is planning to do with Zack Overkill, and a reveal of whom the red-hooded man is (oddly enough, it is just who the story said it probably was--there goes my theory of that being a feint). This is another great issue since the story kicked into gear with issue 3 being the first that really impressed me and this continuing the trend. The scene of Zack losing it looks great. 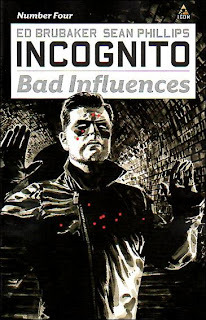 Brubaker and Philips are turning a story just as good as the original mini-series, and the little history-section in the back about pulp characters is always interesting, with detective Nick Carter being examined as arguably the first psudeo super-hero. This is more pulp-style entertainment with the super-hero twist that leaves me feeling satisfied. Checking it out would be recommended.